So Elijah walks into the bathroom while I’m taking a shower, turns off the light, and says, “It’s dark!” and I agree with him. 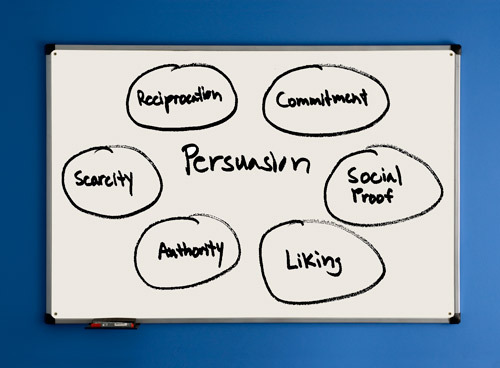 I hope you’ve gotten something valuable out of each of the “persuasion secrets” you read here. I spent a lot of time trying to make sure each of the tips above wasn’t something you’ve heard twenty times before or, if it was, I hope I’ve at least given you some unique ways to incorporate them into your writing online. I hope you found at least one or two things you’re excited to try. And if you experience a difference in your writing, I hope you’ll write me and let me know. I’d love to see how you’ve incorporated some of these suggestions. If nothing else, I hope you got a good laugh reading about Elijah’s exploits and that you’re inspired by his tenacity. He practices relentlessly. And that is the one big secret to writing persuasively — learn about something that might work and test it. If something you’ve read in this article sparked an idea, write it down before you forget it! And then test it in your own writing. Everything you publish for your audience — whether it fails or succeeds — will teach you how to better serve them, and help you to become a part of who you are: A naturally persuasive person.